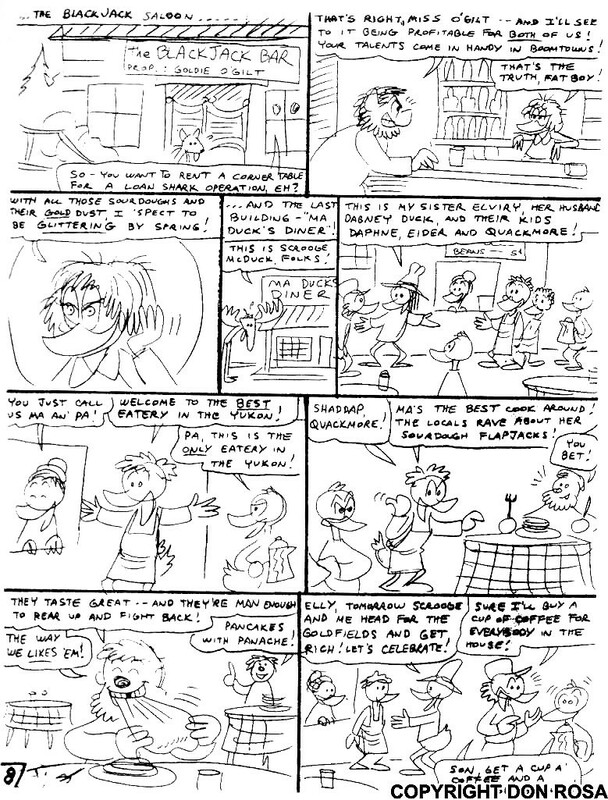 "The Life and Times of $crooge McDuck"
Like any movie, book or screenplay "The Life and Times of $crooge Mc Duck" went through several stages of developement before it finally became the Eisner Awarded epic that it is today. Not to mention that Don Rosa is still writing new chapters to fill the gaps that his initial 12 chapters left open. This page offers several examples of story elements that were altered shortened or dropped completely in the process. Nevertheless those pieces may offer some additional insights on "The Life and Times of $crooge Mc Duck" and we hope you enjoy reading them, too. COVER: The original concept for the Cover to Uncle $crooge #285 shows $crooge remembering a scene that is shown in Chapter I. The publishers thought the scene would appear to be too scary and so the flames cannot be found on the final inked version for the Gladstone cover. Of course there is no one in that armour, but one has to read the story first to know that. 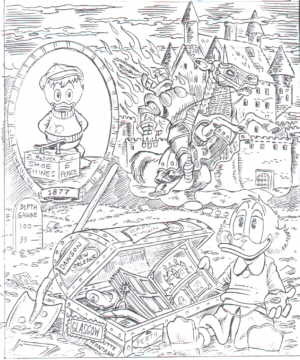 The first draft of Chapter 1 showed the history of the McDuck (resp. Macduich) Clan who´s members played their parts in turning points of history. The story of Scrooge ancestors however did not completely please the publisher, who pointed out that it should rather be the story of Scrooge himself than of his family. So Don Rosa rewrote the first pages of the script to set the focus on Scrooge himself, still using some of the references from the first draft. However, the original first pages of the script is shown here for you to enjoy and compare to the final version, that everyone hopefully has read already. This version of the story is quite different from the one that was printed in the end. Here you can see "Goldie [...] and Grandma Duck getting into a dance-hall-girl vs. frontier-wife brawl right out of DESTRY RIDES AGAIN". The main difference to the final version are Roosevelt´s thoughts about his reelection campaign. The longest of all sketch sequences seems to be very close to the published version. And it is, but unlike in the final version where Scrooge steps out of the canon in the first page Matilda and Hortense play alone in the frame story of the script. The real adventures are reported through letters that Scrooge sends to Matilda and Hortense, who are busy following Scrooge´s way up to the world richest duck. But also Scrooge´s adventures in the middle east and asia are presented with more detail in this version. 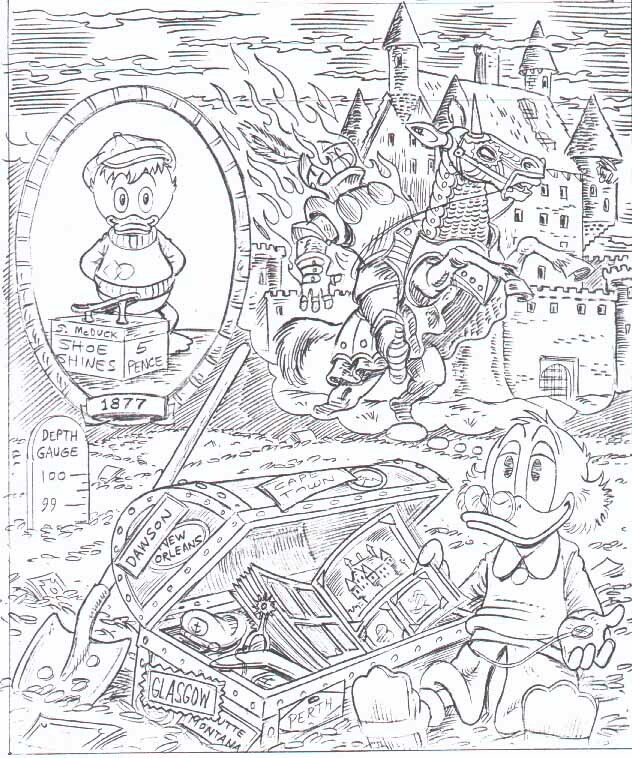 the "Life and times of Scrooge McDuck" Homepage of Dan Shane and Don Rosa. Some of the copies that were used for the images on this page missed the very first line of text, on some of those the text has already been reconstructed so that you don´t miss anything. And the fixes are obvious so that you can see easily distinguish it from Don´s own handwriting! All the comic images available from this page (exception: the scripts labeled Copyrigth Don Rosa) and all characters (like Scrooge Mc Duck, Donald Duck...) are © The Walt Disney Company. They are provided for purposes of study and reference. Disney's copyright is acknowledged and respected. Nothing shown on this page is meant as a Copyright Infringement. If someone has a good reason why a picture shouldn´t be (or should be) on this page please let me know! All requests, questions and complains should go to... me!